I have learned that there are fewer people who sit down to listen to sermons on their computer than there are people who download them on their phone to listen to them while they drive, walk, or workout. Knowing this, I have decided to start uploading all the youth sermons, chapel messages, FCA talks, and anything that is recorded onto this podcast. I have given the podcast an overly simplistic name to keep it simple and to make it distinct from Pear Orchard’s normal sermon podcast for the Sunday sermons. 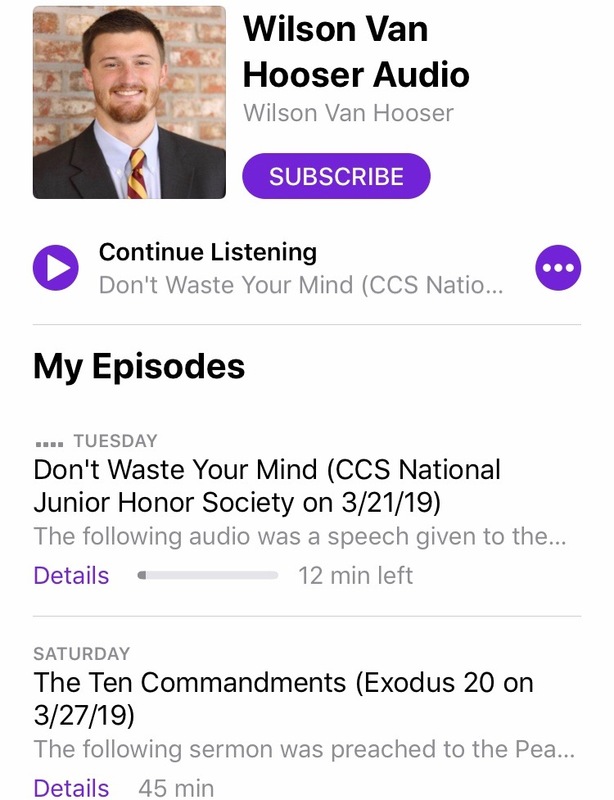 When you download the Apple “Podcast” app (which is free), you then can search for “Wilson Van Hooser” or “Wilson Van Hooser Audio” to find the audio recordings. Hopefully, this will make these recordings easier to access and also easier to pass along to others. I will give a slight warning to all listeners: Since I am speaking primarily to youth, sometimes I make loud noises. Nevertheless, I hope you enjoy. Older PostWill This New Technology Catch The Church "Off Guard"?